The King’s Demons is a romp, pure and simple. Rather like a house of cards, if you examine it too closely then it collapses, but there’s plenty of entertainment to be had over its two episodes. The opening is very impressive as the jousting contest (with Bodiam Castle in the background) looks gorgeous. It may have little to do with the rest of the story, but it’s a welcome bit of gloss. But there’s no way to avoid the first major problem – the Master is disguised (very badly) as a Frenchman. All the James Stoker business leads you to assume that the production team actually considered his disguise would fool people and that the Master’s reveal at the end of the first episode would come as a shock. Hmm, okay then. Frank Windsor and Isla Blair are two of the main guest stars. Windsor was a familiar face, thanks to Z Cars and Softly Softly. 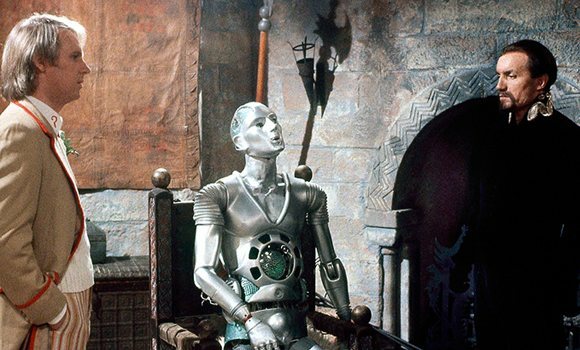 Truth be told, he seems a little stiff and uneasy with the medieval dialogue (he’s much more assured in Ghost Light). Isla Blair is fine with the little she has to do, but then a two-parter doesn’t offer a great deal of room for character development. 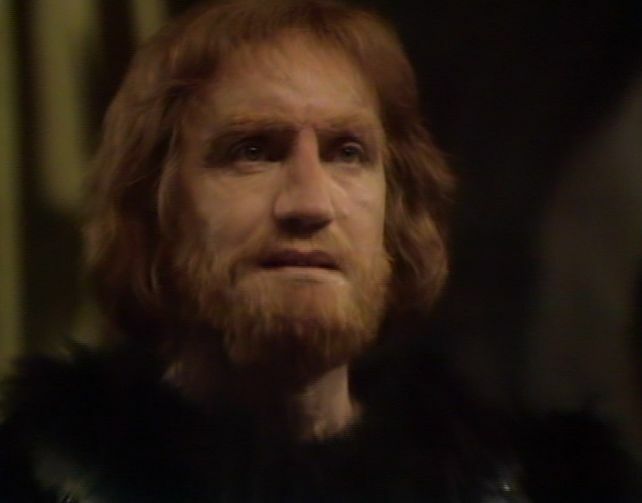 The other guest star is Gerald Flood, who is rather good as King John alias Kamelion. Given his involvement with the Pathfinders series (pretty much a blueprint for Doctor Who and a series that’s fascinating from that perspective) it’s fitting that he eventually landed a part in Doctor Who. Davison gets to swash a buckle, although the Doctor/Master swordfight is a bit limp and not a patch on the ones from The Sea Devils and The Androids of Tara. Tegan complains a lot and Turlough has virtually nothing to do, although you have to admire Mark Strickson for his ability to wring everything from the few lines he has. After the “shock” reveal of the Master at the end of episode one, there’s a rather nice exchange of dialogue between Davison and Ainley. THE MASTER: Oh, my dear Doctor, you have been naive. THE DOCTOR: Not at all. You may disguise your features, but you can never disguise your intent. THE MASTER: And you can’t approve. THE DOCTOR: You know I can’t. THE MASTER: You’ve always been my greatest stimulation, my dear Doctor, but now you inspire me. Although the notion of the Master mucking about with Magna Carta has often been criticised (even within the story itself) I do like the concept of the Master traveling to various planets at different time periods and discretely working away in the background to undermine democracy. There was scope to develop this in future stories, although it never happened. Tegan flying the TARDIS? Uh-oh. The ending is a mess though. The Doctor nips off in the TARDIS and blithely informs Tegan and Turlough that the Master will shortly be leaving as well, without bothering to check or apparently care if he kills anybody else before he leaves. This point, as well as many others, is addressed in Terence Dudley’s excellent novelisation. It’s well worth tracking down a copy as it clearly shows how much better the story could have been as a four parter. Atmospheric location filming, one of my favourite scores, decent guest stars and plenty of incident packed into 50 minutes means that The King’s Demons is never dull. It may be rather unloved, but I like it and if you haven’t seen it for a while then I’d recommended giving it another go.